Tiger Woods is back! And his family couldn't be more proud. In his first major championship win since 2008, Woods added a fifth Masters title under his belt. This is his 15th major championship win in his career. Moments after the crowd erupted in cheers upon his final swing, Woods went over to his family to share a truly emotional moment. As Woods makes his way to toward his family, his son, Charlie, runs up to meet him, hugging him. The pro golfer cheers as he lifts the little boy up. The hug between Woods and his son mirrored another monumental moment in Woods’ life and career. After the golfer won his first Masters in 1997 as the youngest Masters champion, cameras caught the special moment between Woods and his father, Earl Woods, during their congratulatory embrace. Earl Woods died at the age of 74 in 2006. Next to greet the champ was his mother, Kultida Woods. "I'm so proud," she can be heard repeating. Woods then shares a long hug with his daughter, Sam. And then after, his girlfriend, Erica Herman, embraces him. 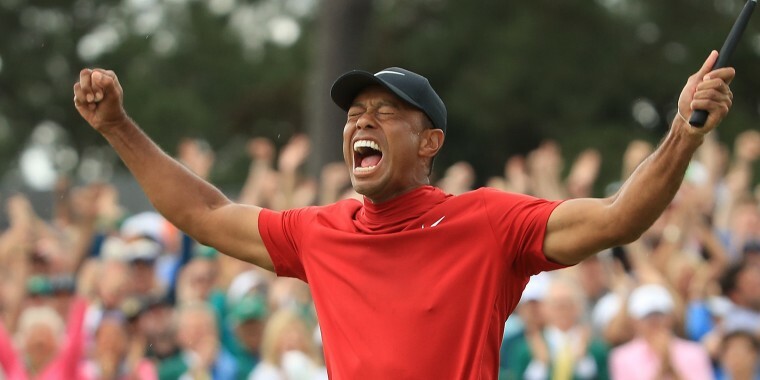 On Sunday, after overcoming a third-round deficit, Woods was able to share that moment with his own son after his major win on the Masters course in Augusta, Georgia.